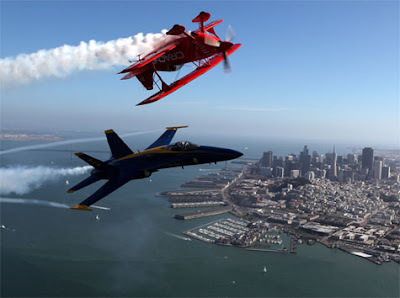 Team Oracle stunt pilot Sean Tucker (top) and a U.S. Navy Blue Angels F/A-18 Hornet piloted by U.S. Marine Corps Major Nathan Miller fly over the San Francisco Bay. We enjoyed bits of the Fleet Week airshow yesterday and today. Sure, hope 'this concept' catches on in the middle east. Just like in that middle-east or far-west. Is this a 'stone henge' set? when you search 'for stuff' you usually end up with 'someone' trying to sell you something.